Value investing is based on the firm belief that market is not efficient, i.e, equities are sometimes mispriced. Value investing is thus a profitable venture by exploiting the price discrepancy. I had already subscribed to the above theory long ago, but my conviction that I can really gain from value investing is further reinforced after reading book, The Alchemy of Finance, written by George Soros. The author does not seems to believe in value investing, he made incredible returns by exploiting market trends. However, he raised a few points in his book which I actually find useful in crediting value investing and helping me formulate a new variant. He asserts that human understanding of a system is aways imperfect. Since people are participants in the market, it leads to a persistent market bias. Since equities are priced according to people's perception, equities are almost always mispriced. Based on this, I came up with a variant of Boom-Bust Model which could explain how Value Investing can be a profitable exercise. The blue line represents fundamental value of an equity. Business cycle results in a change in its fundamental value, fluctuating between periods of business expansion and contraction. The red line represents market valuation of the equity, i.e. the price of the stock. Due to the intrinsic human bias, the red curve always lag the blue curve. Even though there is saying that stock market is forward looking, I believe the market prices lag the fundamentals, resulting in a window of opportunity for value investors. Both valuation curves will fluctuate about the equilibrium line but will never follow it. Competition and many unpredictable challenges (political, economic etc), will never result in a prolonged stabilization of profit for any company. During prolonged boom periods, market still believe that companies can churn out ever increasing profits, resulting in escalating stock prices seemingly aiming for the moon. Behind the scenes, the companies are finding it increasingly difficult to match the last recorded profit, in fact, their intrinsic fundamentals could have deteriorated long ago. In contrast, during a recession, companies can have already strengthened their balance sheets, improved on their business processes and achieved higher efficiencies, resulting in a vast improvement in their fundamental worth, yet the market still condemned them with a sorry valuation. Sometime before the subprime crisis erupted in the US, I believe the business fundamentals had already deteriorated. Sometime before the Singapore sees the end of the SARS crisis, I believe companies had already restructured and consolidated their business to emerged stronger and leaner to fight again. Due to changes in the business landscape, be it macroeconomic or microeconomic issues, demands for the company's products and services declines, leading to periods of contraction. As a result, market pessimissim sets in. A depression of stock prices follows, often in a larger magnitude than what company fundamentals justify. Excessive pessimissim results. As demands for the product and services of the business wanes, the company often had to undergo restructuring, paring of excesses and inefficiencies. After periods of struggle, business itself and its environment starts to get better. Demand for its product and services improves and results in a stronger bottom line. Fundamental value of the company recovers from its trough. After some time, market finally recognizes the recovery and price bottoms out. As business landscape continue to improve, company's earnings improve quarter after quarter. As company performance improves across the various industries, market sentiment picks up as well, leading to a period of optimism that see share prices rising higher than what the fundamentals justify. As many companies begin to report record earnings, market begin to accord higher and higher valuation to each company. This irrational market exuberance finally reaches a height that is not sustainable. One day, the economy will cool and as product and services demands wanes again, sky high profits can no longer be sustained. The plunging prices ensues without surprise. Since periods of extreme pessimissim in market sentiment always comes after a recovery in fundamental value, this results in a much more spectacular recovery in market prices thereafter. Respectable returns can be achieved simplify by purchasing a stock whenever it is sold at a steep discount to its fundamental value. This almost always occur during periods of poor market sentiment. Invoking George Soros hypothesis that human's imperfect understanding always deviates from true reality, this implies that any fundamental stock valuation must be flawed. Fortunately, the idea of margin of safety, central to the theme of value investing, preempted particularly this problem. By ensuring that the stock is only purchased if Mr Market quotes a good price, i.e. one well below its intrinsic value, one can be fairly sure the margin of safety protects him from his potential flaws in valuation, provided one takes a prudence approach in deriving the valuation. This imperfect of human understanding can also leads to the market bias in macroeconomic perception, i.e. 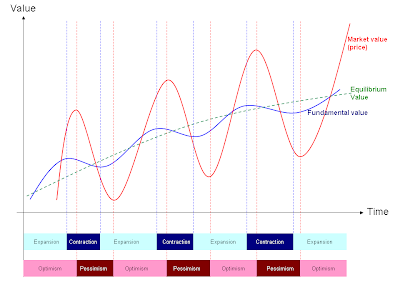 the market macroeconomic perception curve also lags the fundamental macroeconomic reality, just like the market valuation lags fundamental valuation in the diagram above. Thus, in additional to the concept of margin of safety and fundamental valuation, I'm toying with the idea of incorporating macroeconomic analysis in stock selection. Lets say, assuming after stock screening, I found 3 stocks trading at a discount to their fundamental worth, can I further narrow down the list to select one that is also weighed down due to a temporary negative macroeconomic penalty? Take for example a temporary negative macroeconomic factor (high oil price, commodity price etc) results in a depressing business environment for one of the 3 businesses, resulting in a depressed profit and hence the current valuation and traded price. When the temporary macroeconomic penalty is lifted, not only will the stock price bounce towards and above its intrinsic value (estimated with just the business in focus), a further premium is added by virtue of the extra profit derived when the extra weight of the negative macroeconomic penalty is removed. Though I have not employed macroeconomic analysis in my stock selection yet, I will like to see whether any stocks in my current portfolio is also suppressed by temporary macroeconomic penalty. Historically, oil prices had spiked and plunged for various reasons. I believe it is not a matter whether the price will come down but when. Logically, if a recession follows, oil demand will drop and a price drop is predictable. In addition, with each USD $10 increment in oil price, a more expensive alternative source of fuel becomes viable, biomass, biofuel, solar, wind etc. The high oil price cannot be sustained forever. I bought SIA on 16th January 2008. I did not discuss much about the purchase because it is a "blue chip" and hence the whole market is looking at it. For a blue chip to fall below 1.3 times book is considered relatively cheap. The current poor market sentiment is one contributing factor for this price, another is the high oil price. Commodity prices also follows a boom-bust cycle. Coffee prices had escalated and looks like a bubble waiting to burst. Higher prices ultimately leads to greater supply (when more people grow it or when weather finally gets better?) and hence lower prices. Hopefully, Food Empire and Tsit Wing (also depressed by high tea prices) can ride out this bubble. US had been happily printing money and borrowing to meet its unrestrained consumption. Its growing debt and trade deficit ultimately means its high interest rate cannot be sustained and results in a rapid devaluation of its currency. Current account balance as a ratio of GDP is a good gauge whether their high interest rate can be sustained. (Using the same yardstick, the next to devalue could be Australian dollars with account balance of -5.6% of GDP and New Zealand dollars -9.5% of GDP compared to US, -4.7% of GDP). This devaluation will actually help to make exports cheaper and reduce US trade deficit. Once the economy recovers, USD will once again strengthen. First Ship Lease's revenue and hence shareholders dividend is derived in USD before converting to SGD. Once USD strengthen, the dividend in SGD will improve. Contrarian or just forward looking? I'll just like to make another point before I conclude. Contrarians are deemed as market weirdos or heroes who bet on the opposite of things. But if I'm right that market valuation always lags fundamental value, then contraians might be just being forward looking than merely betting against persistent trend. They knew the current trend cannot be sustained indefinitely. I had been actively employing value investing as my investing strategy. Going forward, I might just add another dimension to it - macroeconomic analysis. Whether I'm right or wrong, only time will tell. What about buy and hold I do not mean forever but it could be for a long period of time time. Their are stocks like petsmart that traded at 2 dollars a share 11 years ago now the stocks almost fifty. Also pricesmart traded at about 7 dollars a share about seven or eight ago now its almost around sixty dollars. Their are many other examples Apple computer traded ar only 5 dollars a share in 1998 now its over 400. These stocks are being held quite a long time generally speaking I would say four to six years would be about right as far as buy and hold go. I have a website where I have been following stocks under five dollars. I generally hold my stocks anywhere form 2 to 6 years. Stocks -- fooled by randomness?